A smoke plume rises from an airstrike behind a tank belonging to forces loyal to Libya's Government of National Accord during clashes in the suburb of Wadi Rabie, south of the capital, Tripoli, April 12, 2019. "The risks to their lives are growing by the hour. They must be urgently brought to safety. Simply put, this is a matter of life or death," U.N. High Commissioner for Refugees Filippo Grandi said in a statement Friday. The agency said the migrants are "believed to be trapped in detention centers where hostilities are raging." Since the conflict escalated last week, "more than 9,500 people have been forced to flee their homes," the U.N. refugee agency statement said. 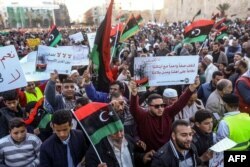 Libyans wave national flags and chant slogans during a demonstration against strongman Khalifa Haftar in Martyrs Square, Tripoli, April 12, 2019.